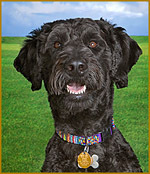 It is a cross between a Standard Poodle and a Giant Schnauzer and is definitely in the LARGE category of dog breeds. A fully grown adult will weigh 65 to 80lbs - they average around 70lbs. Like Giant Schnauzers, Schnoodle males will measure 25½ to 27½ at the withers (where the neck joins the back) and females will be a couple of inches shorter. The Giant Schnoodle combines the characteristics, temperament, coat and of both the Giant Schnauzer and the Standard Poodle. Both of these breeds are intelligent, loyal, love being with people and are generally easy to train. You could expect your dog to be similar to this. Because they are so intelligent, they sometimes need a a firm hand as they can get easily bored. They can be protective of the family - like the Giant Schnauzer - and are usually very good with children. To keep your Giant Schnoodle happy, you DEFINITELY need to give him plenty of daily exercise. Don't think about getting one unless you're prepared to take him out for at least an hour a day. Many Schnoodles - especially the smaller ones - are fairly adaptable when it comes to exercise. But the Giant is a very large dog (the clue is in the name...!) and WILL require regular daily exercise if he or she is not to become bored or frustrated. If you like Schnoodles but are not keen on the idea of hours and hours of exercise every week, then a smaller Schnoodle with one parent a Miniature Schnauzer or Miniature Poodle might well be more suitable for you. Many big Schnoodles do well in agility classes and competitions. Their boisterous nature and active minds love the challenge of racing round that course! They are definitely water dogs, they love the snow and do well in almost any climate. Both Schnauzers and Poodles are hypoallergenic and non-shedding, but this does NOT mean that your Giant Schnoodle will be non shedding as well.The chances are that it will be, but there is NO guarantee. The Schnoodle coat can vary from woolly to wiry. Some puppies will be non shedding while other pups in the same litter may be shedders. You need to select the individual dog very carefully, according to your needs. You have more chance of knowing how your dog will turn out if you select an F1 (first generation)cross between a purebred Poodle and a purebred Schnauzer. Find out why on our other Schnoodle pages listed below. In short - the Giant Schnoodle can make a fantastic family pet, provided you pick the right one and you are ready to give him lots of exercise. Schnoodle Puppies -Savior or Scoundrel? 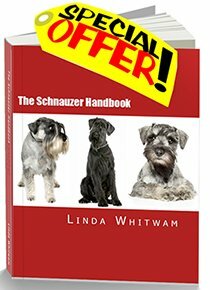 Schnoodles - What Are They Really Like?